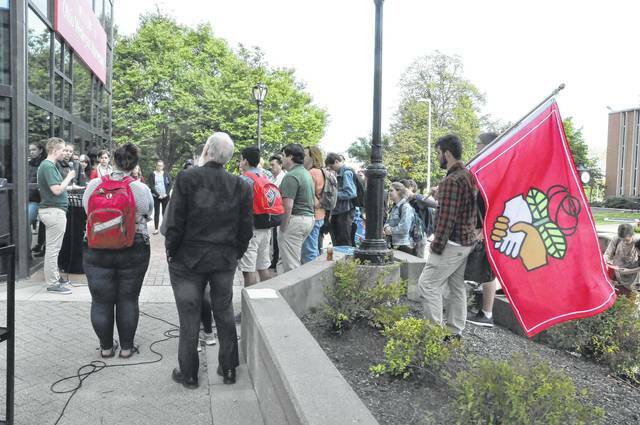 Ohio Wesleyan University students rallied Wednesday to protest President Donald Trump’s plan to phase out Deferred Action for Childhood Arrivals, or DACA. OWU Chaplain Jon Powers organized the event on the steps of the Hamilton-Williams Campus Center and was one of the main speakers. Powers said it was crucial that people speak out against President Trump’s decision to rescinded the policy that allowed certain illegal immigrants who came to the United States as minors to receive a renewable two-year period of deferred action from deportation and gives them eligibility for a work permit. The policy effects approximately 800,000 young people. 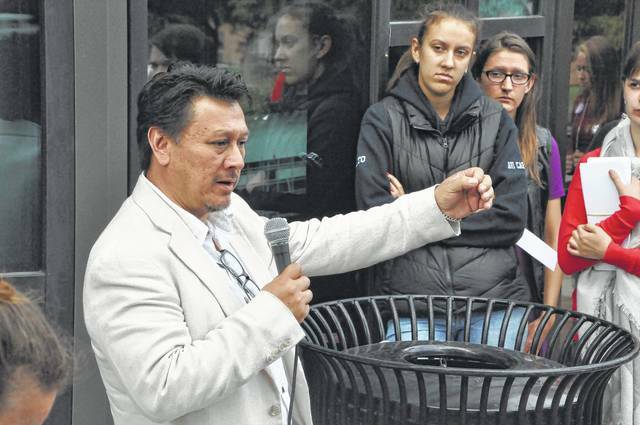 Powers also invited Juan Armando Rojas Joo, a Spanish and Hispanic American Literature professor and Associate Dean for Diversity and Inclusion at OWU, to speak to the dozens of students in attendance. Rojas encouraged students in attendance to speak to their classmates and friends about DACA and what they can do to help. Student volunteers handed out information about contacting the White House, Senators Rob Portman and Sherrod Brown and Rep. Pat Tiberi to ask them to work with congress to pass a legislative solution to protect the individuals effected by the DACA phase out. The gathering lasted about an hour and was attended by several dozen students and faculty members. Students and faculty members at Ohio Wesleyan University gather outside the Hamilton-Williams Campus center Wednesday afternoon to protest President Trump’s phase-out of DACA. Juan Armando Rojas Joo, a Spanish and Hispanic American Literature professor and Associate Dean for Diversity and Inclusion at OWU, speaks to the crowd and urges them to talk to their friends and classmates about DACA. This entry was tagged owu. Bookmark the permalink.